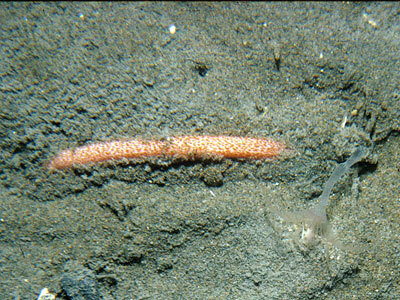 ECHINODERMATA : APODIDA : Synaptidae STARFISH, SEA URCHINS, ETC. Description: A worm-like holothurian which burrows in muddy sand and has twelve digitate tentacles and no tube-feet. Each tentacle has four digits. The colour is pink or red-brown, sometimes purple. The spicules are anchors and racket shaped anchor-plates with handles. Up to 30cm in length. Habitat: Burrows in clean or muddy sand and reaches out of its burrow to collect fine particles of detritus with its tentacles. Found from the lower shore to 70m depth. Distribution: Recorded from all western coasts of the British Isles. Similar Species: Labidoplax thompsoni (Herapath, 1865) is a similar species which differs primarily in having strange irregularly thickened plates in the anterior end of the body. 12 tentacles each with 4 digits. Picton, B.E. & Morrow, C.C. (2016). Labidoplax digitata (Montagu, 1815). [In] Encyclopedia of Marine Life of Britain and Ireland.